Over 2,400 entries were submitted. Sari Warshawsky of Montreal, Que. and Abby Robitaille of Oakville, Ont. are the two winners. Sari Warshawsky, author of Nameless, and Abby Robitaille, author of The Greater Good, have been declared the winners of The First Page student writing challenge. CBC Books asked students from coast to coast to give us a glimpse of the great Canadian novel of the year 2167, presenting how current-day trends and issues have evolved in 150 years. Over 2,400 students from across Canada entered The First Page. A team of readers narrowed that down to a shortlist of 20. Judge Erin Bow, the bestselling YA author of books like Plain Kate and The Scorpion Rules, chose the two winners. 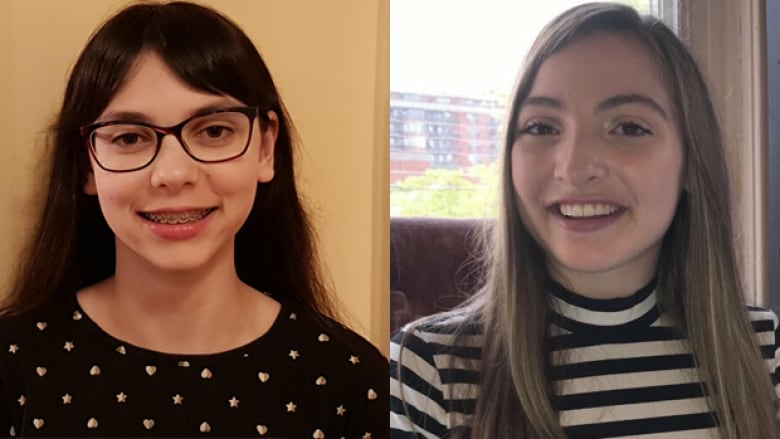 Warshawsky, a student at Royal West Academy in Montreal, Que., was named the winner in the Grades 7-9 category and Robitaille, who attends White Oaks Secondary School in Oakville, Ont., took home the top prize in the Grades 10-12 category. Warshawsky, 13, chose to write about "the pressure of perfection" in the digital age in Nameless. Bow said the piece was "science fiction at its finest." "Nameless works on its own terms, but it also could be read as a sharp critique of the omnipresent world of social media that envelopes today's young people. It made my heart ache for today's kids, and it made me think." Robitaille, a student at White Oaks Secondary School in Oakville, Ont., tackled oppressive dictatorships and press censorship in The Greater Good. Bow said she was hooked from the first line of the story: "The beauty of running a benevolent dictatorship is that benevolent is a relative term." "I picked The Greater Good because it's just so much fun. If you read teen fiction, you've seen it before: the crowd of nervous teens waiting for some terrible trial or competition to begin. But here, it gradually emerges that the kids are waiting to see who is going to be picked as an apprentice to the evil dictator," said Bow. "The story stayed with me. I would absolutely read more of it, and in the end, that's what storytelling is about." Both Warshawsky and Robitaille will receive a one-year subscription to OwlCrate, which delivers a fresh box of YA books to readers on a monthly basis. In addition, their schools will each receive 50 free books. Are you a student who loves to write? Sign up for our newsletter below to find out about our creative writing challenges, including Shakespeare Selfie in April 2018, judged by Kenneth Oppel. Winner: Nameless by Sari Warshawsky from Montreal, Que. Post-War Privation by Zoya Anwar from Regina, Sask. The Test for Humanity by Henna Cho from Calgary, Alta. Count Down by Teaghan Fetherstonhaugh from Calgary Alta. Love Forgotten by Ganga Kandanchatha from Oakville, Ont. Subjects by Alexa Loo from White Rock, B.C. Underground Artist by Henry Nguyen from Vancouver, B.C. Finding Out Who I Am by Mikaylah Ramos from Winnipeg, Man. Planet X by Schuyler Siewe from Calgary, Alta. Trapped by Ethan Zheng from Guelph, Ont. Winner: The Greater Good by Abby Robitaille from Oakville, Ont. Canada 300 by Anik Babul from Richmond Hill, Ont. Data Wars by Trent Baker from Summerside, P.E.I. The Galaxy Rover by Elessia Cantara from Montreal, Que. Slowly by Emma Cole from St. John's, N.L. Fuel to the Fire by Oghenetega Eriavbe from Calgary, Alta. Willingly Immured by Melissa McAllister from Brossard, Que. The Churchill Hotel by Nicholas Onorato from Toronto, Ont. Where the Water Runs Red by Claire Trotter from Mississauga, Ont.